Trust AAMCO Transmission Repair Shop of Anaheim, CA’s skilled technicians for comprehensive diagnostic, repair and maintenance services for your vehicle’s transmission. If your high-end European vehicle is in need of transmission repair, call the experts at AAMCO Transmission Repair Shop of Anaheim, CA. AAMCO is one of the most trusted names in the business regarding transmission issue diagnosis, service and maintenance and has been for over 50 years. At AAMCO Transmission Repair Shop of Anaheim, CA, we have the technology and the expertise to pinpoint the root of the transmission problem in your Audi, Mercedes Benz, BMW, Volkswagen, Mini-Cooper and similar high-end European vehicle makes & models efficiently and effectively. At AAMCO Transmission Repair Shop of Anaheim, CA, our expert technicians will determine and make recommendations for whatever services are necessary for your high-end European car, truck or SUV. What sets us apart is our comprehensive diagnostic approach to ensure that you only get the repairs you need and your vehicle is safely back on the road as quickly as possible. 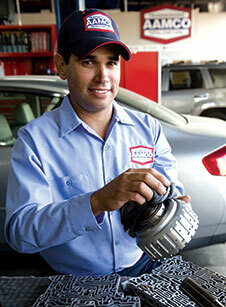 AAMCO Transmission Repair Shop of Anaheim, CA is your local & trusted total car care & repair center. Please stop in today or call us now to schedule an easy appointment.